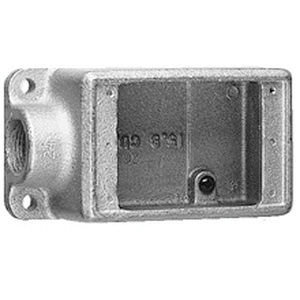 Crouse-Hinds Condulet® 1-Gang Shallow FS device box is suitable for use with threaded rigid and IMC conduits. This device box with one 1-Inch hub, features Feraloy® iron alloy construction and electro-galvanized finish with aluminum acrylic paint. It has a dimension of 2-3/4-Inch x 5-9/32-Inch x 1-7/8-Inch. This device box supports surface mounting for making installation easier. It comes with ground screws and mounting lugs. Device box is UL listed and CSA/ANSI certified.